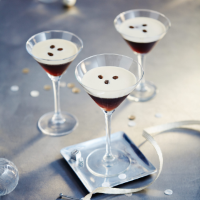 This drink is so popular now… And if you’re prone to snoozing on the sofa before the clock strikes 12, an espresso martini could give you the caffeine boost you need to stay awake to see in the New Year! 1. Put all the ingredients apart from the coffee beans in a cocktail shaker. Shake hard, strain once, then strain again into a martini glass. Garnish with three coffee beans.